If you have an elementary school-aged child at home, this would be a good investment, if for nothing else, the Steelbook alone. Starting out in 1973, a little boy named Michael is shooting hoops in his backyard after midnight with his father, not missing one basket. The little boy outlines his life-play for North Carolina, win a Championship, and play for the NBA. After all that he's going to play baseball, which is a "real" sport according to his dad. Then is dad makes a prediction: "And then you'll fly", helping the little boy straight into a dunk shot on the real court. His career and his basketball retirement speech are highlighted within the first ten minutes of the film. As he then walks onto the baseball field and up to bat, the catcher for the other team tells him when to swing and not to swing. Trying to see Michael Jordan (who plays himself) as a baseball player is hard work and requires one to suspend belief a little ( I mean I know he did it in real life but even though one had to suspend belief a little). Suddenly, from outer space, an animated spaceship flies over the baseball field (unbeknownst to anyone below) and the scene changes to Bugs Bunny in the forest. One wonders, is this a movie about Bugs Bunny and the Warner Brothers crew or it is about Michael Jordan's life? As if that wasn't enough, we then see Jordan out golfing. When he hits the ball he misses the hole but an alien magnetizes the ball and pushes it in the hole. From that point on, Michael was in "Looney Land". 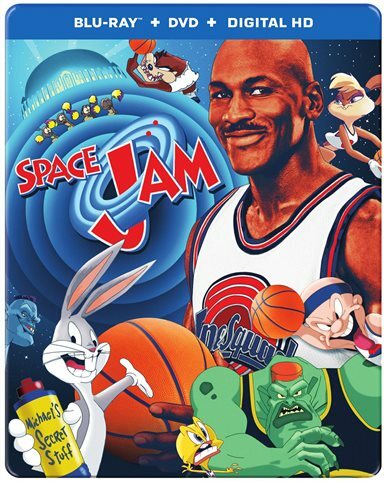 In order to help Bugs Bunny and his friends recover Earth from the aliens, who have stolen the basketball talents of other famous players, Michael must team up with Bugs, Daffy, and the rest of the crew in order to beat the aliens, get the talent back to the rightful players, and banish the Aliens from Earth forever. Do the first three paragraphs seem confusing? That's because they are, just like the movie. Director Joe Pytka did his best with a poor script and Michael Jordan, Patrick Ewing, Larry Byrd, Charles Barkley as actors. Luckily, Pytka also had Bill Murray (St. Vincent), who played himself, and Danny Devito (Taxi) who voiced the alien, Swackhammer. The latter two add some credibility to an otherwise less than stellar movie. The Blu-ray video is MPEG-4 AVC with a 1080p resolution and an aspect ratio of 1.77:1. The picture is clear, but clearly from a twenty-year old perspective. It is not as clean and crisp as the newer movies. The animation is clearly the original style instead of a more modern type created on computers. While the live portion of the movie is somewhat bland, the animation itself is refreshing, in that it was kept original. If you are looking for a "throwback", this movie will be somewhat up your alley. The audio is presented in DTS-HD Master Audio 5.1. and unfortunately sound system is not needed for the loud music that often times overpowers the dialogue. While the catchy music sets the mood to get the audience excited about what is happening most of it seems out of place- like the filmmakers had to highlight the artists' music, regardless of whether it made sense or not. Because of this, it's easy to get distracted from the movie itself but maybe that was the plan all along. In the 90's, famous non-actors were getting a shot in Hollywood, and this definitely makes for a bit of kitsch factor in the film, but, nonetheless, if you have an elementary school-aged child at home, this would be a good investment, if for nothing else, the Steelbook alone. Download Space Jam: 20th Anniversary Steelbook from the iTunes Store in Digial HD. For more information about Space Jam visit the FlickDirect Movie Database.